Aka.. My Girlfriend is a Nine-Tailed Fox, 내 여자친구는 구미호or Nae Yeojachinguneun Gumiho is the latest from the Hong Sisters. After their last show, You’re Beautiful, I had high expectations. That is probably terribly unfair to this cute and fun show. This was light hearted fair and didn’t have me racing to the next episode, but I did enjoy the series and once again loved Lee Seung Gi, although he was better near the end and showed more depth both as a character and an actor. I got a little tired of his cute good guy act and can’t wait for him to eventually take a role that really shows his acting chops. This is the first time I’ve seen Shin Min Ah although I had heard of her from the T.O.P. girlfriend rumors awhile back. She is very cute and though I grew to like her I wasn’t blown away by her as an actor or character. I think she could have gone farther with the scary Gumiho stuff, but kept it all pretty tame and he big cry scene made me cringe instead of cry, but she is very cute and had some definite charm. No Min Woo, of Pasta fame also had his second showing for me here. It was great to see him in an expanded role and he was cute as ever. I can’t lie, he made Hyun Joong seem like an actor of depth and deep feeling, so wooden isn’t even strong enough but occasionally you could just glimpse something beneath the surface that gives me lots of hope for future roles. I could never totally get a handle on who he was in this drama, not really a second man, not a villian. Maybe he didn’t know either and that is why he just stood with a hollow look most of the time. And he is much more attractive when he shakes off the perfect structure of hair and makeup and you can actually see him as a person come through. Anyway, here’s hoping to see more of him in the future. My favorite character was Sung Dong Il, as the director. He was hilarious and super funny. If you like Hong Sisters dramas, you will no doubt like this too. It was cute and enjoyable, probably just a notch under Sungkyun Kwan Scandal for me. It just felt like the Hong Sisters hadn’t quite thought through who these characters were and what they were bringing to the story rather than it being story driven with some cute moments and characters thrown in. Overall Grade B.
Thats interesting drama. 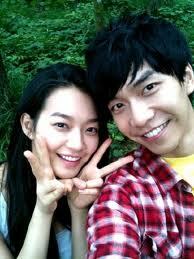 I love gumiho and hope they’ll stay together. Thanks for posting.